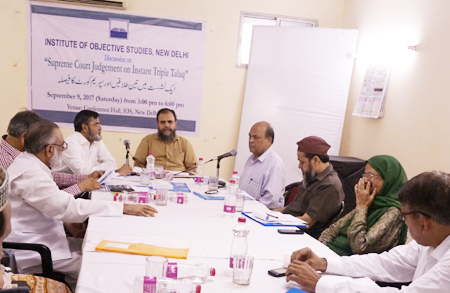 The Institute of Objective Studies (IOS) organised a discussion on “Supreme Court Judgment on Instant Triple Talaq” at the Institute’s conference room on September 9, 2017 in order to convey the conclusion to the All India Muslim Personal Law Board (AIMPLB) which was scheduled to meet at Bhopal on September 10, 2017. 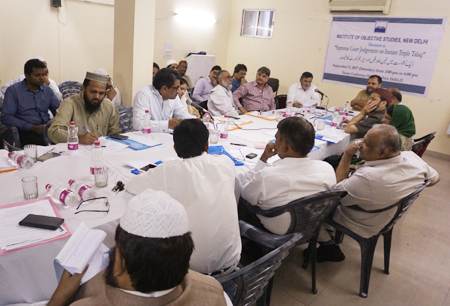 The suggestions of milli organisations, Islamic scholars and lawyers on the issue were to be discussed at Bhopal. Initiating the discussion, the advocate-on-record, Supreme Court of India, Mushtaq Ahmed, said that the matter of triple talaq arose out of a case relating to Hindu marriage filed in the apex court with regard to the question of the share of a woman in family property. The case was filed under the Hindu Succession Act. The case was being heard by Justice Adarsh Kumar Goyal and Justice Dave. He observed that though Muslim women were nowhere in the picture then, yet both the judges issued a suo motto notice to the Attorney General to file a reply on the plight of Muslim women. Strangely enough, the title of the notice received in the registry of the legal services cell read “Muslim Women’s Quest for Justice.” This was enough to induce Muslim women petitioners to move the court. The case was filed in the Supreme Court which took notice of it and categorised it as the most urgent matter. He noted that the urgency for hearing the matter was beyond comprehension as more urgent matters, like the implementation of Sri Krishna Commission Report and criminal conspiracy case against LK Advani and others were pending hearing in the Supreme Court. Explaining the judgment of the court, he said that the plea of respondents like AIMPLB and Jamiat-ul-Ulema that Part III of the Constitution did not touch personal law, was accepted. The court ruled that it was the responsibility of the government to legislate if any corrective measures needed to be taken. Interpreting the minority judgment, he said that he viewed divorce as part of Shariah and as such protected by Article 25 of the Constitution. Besides, several verses of the Quran were quoted in the minority judgment to buttress the point. Referring to the majority judgment as law, he said that the minority judgment was of academic interest. He asked Muslims to hail the judgment and desist from issuing statements contrary to it as it might give a handle to opponents of Muslims. Mr Shamshad, a Supreme Court advocate, held that according to the majority view, unilateral talaq was arbitrary. Justice Rohington Fali Nariman took the arbitrariness route and said that there was a scope for reconciliation in divorce proceedings. He explained that an enactment on personal law was not easy as this item found place in the Concurrent List. He said that while hearing the case, views of all the schools of Muslims law were not taken into consideration. He emphasised that the judgment had become a law and we must tell the community that the instant triple talaq was a sin. Dr. Wasim Ali from the Department of Law, Aligarh Muslim University, endorsed the majority judgment and said that talaq was neither good nor acceptable. This was ultra vires of the Constitution as well as against the Quran and Sunnah. He insisted that both the majority and minority judgments conformed to the Quran and Shariah to some extent. He said that all Muslim organisations were against triple talaq. 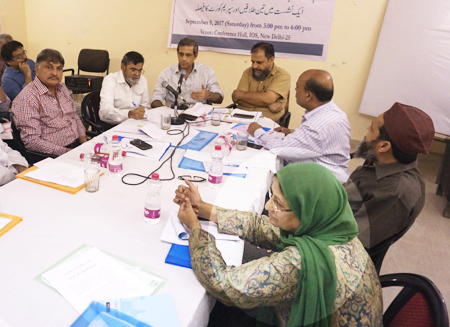 Prof. Shakeel Samdani from the Faculty of Law, AMU, regretted that no movement on triple talaq was launched by Muslim organisations in the last 15 years after the case was filed by Shamim Ara in 2002. He said that we must be thankful that the entire personal law was not declared null and void by the court. He advised against filing of a petition for review of the judgment. If anyone did so, he would be doing a great disservice to the Muslim community. 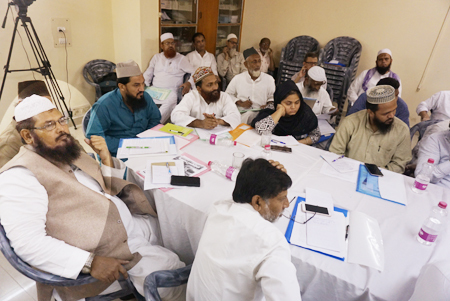 He urged the prominent Muslim organisations to fan out in the remotest corners of the country and advise Muslims against the bad practice of triple talaq. While holding that no Shariah law was above the Quran, he stressed the need for opening the channels of communication with the Prime Minister. He said that intelligent groups did not confront the government of the day. Advocate Mahmood Paracha commented that Muslims in India were in existential danger. Their right had been snatched away. He saw no logic in the judgment except in the observation made by Justice Kurien Joseph. Terming the triple talaq judgment as political, he said that we should not accept the verdict if we wished to die as true believers and warned that if we failed to raise our voice against the judgment, many more such judgments would follow. If one read the judgment from the angle of an aggrieved woman, he would conclude that she was not going to get relief from the verdict on triple talaq. If the verdict was not opposed, it would open flood gates of attack on Islam. The Muslim Personal Board Law Board, or any other Muslim organisation for that matter, should engage with the task of fixing women’s rights, he added. Visiting Professor, Amity University, Prof. Khwaja Abdul Muntaqim, observed that since the judgment had now become law, it must be incorporated as such. He favoured amendment to the Sharia Act to make a provision of punishment for triple talaq. The punishment for such act, he said, should be imprisonment up to six months. He argued that there was nothing mala fide about making a provision for punishment if it was bad in both theology and law. Maulana Yaqoob Khan Shahjahanpuri said that talaq should be in accordance with the procedure provided in the Quran. Quoting the second Caliph of Islam, Hazrat Omar, he said that the Caliph had ruled that triple talaq should be treated as one-time talaq. The Muslim community would not be affected by the judgment, he noted. Secretary All India Majlis-e-Mushawarat Maulana Abdul Hameed Nomani pointed out that we had failed to explain the matter in a proper perspective. He said that there were only two talaqs – either according to Sunnah or against Sunnah. He said that the instant triple talaq was a sin and one who indulged in it must attract penal provisions. He said that we never made it known that women had equal rights. No government wanted to follow Shariah and what was lawful or illegal in the eye of law might not necessarily be allowed or disallowed under Shariah. In Islam, man had not been given superiority over a woman. If a man divorced his wife without proper reason, he must be punished, the maulana concluded. Editor, Kanziatul Imaan, Delhi, Maulana Zafaruddin Barkati, opined that the point at issue was not talaq, but the mode of divorce. He suggested that a delegation comprising ulema and Islamic scholars should call on the Prime Minister and submit a memorandum in this connection. He also suggested that issues of non-Muslim women should also be raised. 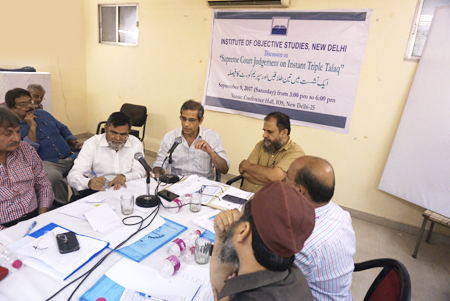 Prof. Arshi Khan of AMU observed that the apex court had opened floodgates for the courts to entertain other issues concerning Muslims. Instead of being comprehensive, the verdict stuck to the Quran only, leaving Hadith untouched. He said that the case was hurriedly taken up and decided without critically examining the issues involved. This gave rise to the apprehension being expressed in certain circles that the judgment was political in nature. Going by our numerical strength – 20 percent of the world Muslim population – we must silently protest against the verdict by organising debates in which ulema, Islamic scholars and other academics should be invited to speak and share their views. Since this government was gradually losing legitimacy, we must not desire to meet the Pime Minister. Rather, he must desire to meet us. He remarked that it was a psychological war or else the rate of divorce among Muslims was just a fraction of the total. Mansoor Ali, advocate, expressed the view that nothing substantial was likely to come out of a revision petition. He was apprehensive of the adverse impact of the verdict. He said that the AIMPLB must convince non-Muslims that Islam was the best religion in terms of giving equal rights to its women. President of Jamiat Ahle Hadith, Maulana Asghar Imam Mehdi, held that the verdict was a backdoor infringement on the Muslim personal law. He suggested that personal laws of both Sunnis and Shias must be compiled to put up a brave front before those who were opposed to it. This would, hopefully, “restore our image” before others, he concluded. Prof. Hasina Hashia of Jamia Millia Islamia questioned the timing of the case and the judgment delivered by the Supreme Court. She said that Muslim Mahila Andolan, an affiliate of the BJP, was roped in to file the case in the court. 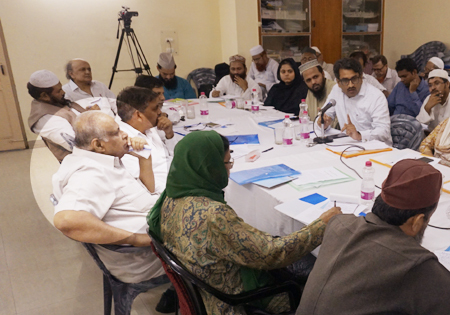 The issue of talaq was raised after the UP Assembly elections to prepare a ground for securing a Uniform Civil Code. She emphasised the need for unity among Muslims and enlightenment of the political parties on the issue of talaq. 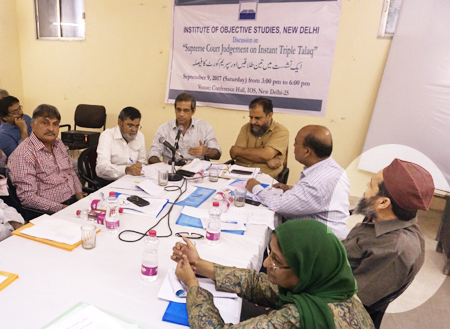 Presiding over the symposium, Prof. M. Afzal Wani of the School of Law and Legal Studies, GG Singh Indraprastha University, and Assistant Secretary General, IOS, pointed out that the onus of understanding human history devolved on the Muslim most. It was also the duty of Muslims to be sensitive to their own community. Referring to the importance of education, he said that it was the Quran which first used the word “Iqra” that meant “Read”. It was due to Iqra that crores of books on different subjects had been published so far. Commenting on the judgment on triple talaq, he said that it was politically motivated as Shayra Bano’s estrangement with her husband was 10-year old. What then prompted the court to hasten the disposal of the case? he quipped. He said that the court proceedings were meaningless as respondents’ pleas went unheeded. An impression was being created that Islamic jurisprudence had pitfalls and it would be in their own interest to adopt a system that was followed by others. 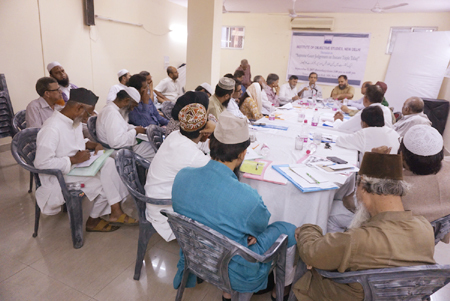 Thus it had now become imperative to disseminate the knowledge of Islamic jurisprudence in the community. Underlining the importance of jurisprudence, he said that a nation was worth its jurisprudence. While calling for end to injustice, if any, to women, he counselled not to be swept away by emotions. He said that there were so many issues that could be settled within the community without going to the court. He also asked Muslims to develop a strong financial system. Zakat and Islamic banking were the institutions that needed to be firmed up. Similarly, every effort should be made to put the money to better use, he added. Earlier, the symposium began with the recitation of a verse from the Quran by Hafiz Wasim Nadwi. 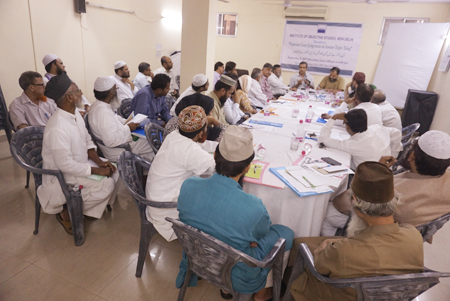 Proceedings of the seminar were conducted by Dr. Nakhat Husain Nadwi. 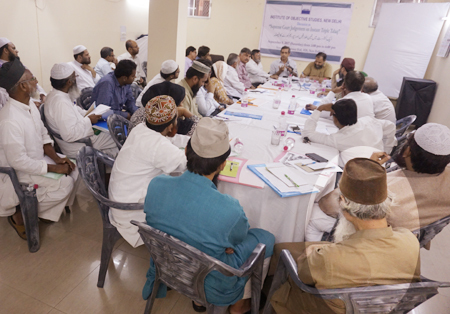 The seminar was attended by several scholars, ulema, social activists and prominent citizens.